Link and George Thom with Link's Flash Equipment, 1956. Maud bows to the Virginia Creeper, 1956. Sometimes the Electricity Fails, Virginia, 1956. Shaffers Crossing Roundhouse. Roanoke, West Virginia. 1958. Mr. and Mrs. Ben Pope watch the last steam powered passenger train. Max Meadows, Virginia, 1958. Birmingham Special, Rural Retreat, Virginia, 1957. O. Winston Link (1915 – 2001) was a commercial photographer and train buff who in the mid 1950s devoted five years of his life to recording the last days of steam on the Norfolk and Western railway line. Photographing at night (when the steam appeared white against the black sky) and enlisting both train personnel and locals as supporting cast, Link produced his own quasi-Rockwellian vision of a world that was soon to pass. Gregory Crewdson is one of the pioneers of large scale contemporary color photography known for his elaborately staged and lighted tableaux of mysterious small town life. Long seen as one of a group of photographers (along with Jeff Wall and Cindy Sherman) whose work was influenced by Link, Crewdson has openly acknowledged his admiration for Link and even brought the photographer to Yale, where he now heads the prestigious MFA Photography program. 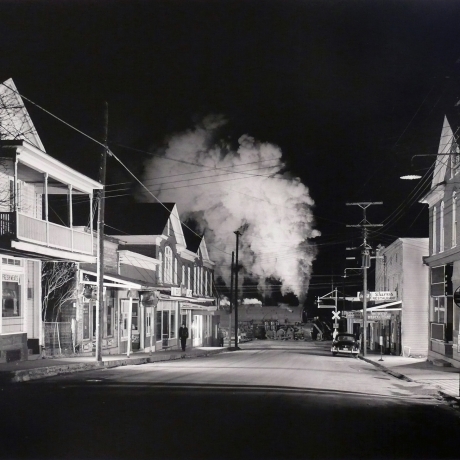 Danziger Gallery has exhibited Link’s work since 1990, during which time James Danziger and Gregory Crewdson had often discussed the idea of a two person show, but a recent acquisition of a large group of Link’s most important images served as the catalyst for finally making the show happen. Comprising 16 of Link’s 16x20 inch black and white photographs and three of Crewdson large scale (60 x 90 inch) color works selected by the artist for their relationship to Link – the show unites these two important American photographers in a joint show for the first time. When did you first become aware of O. Winston Link’s work? I first became aware of his work when I was an intern at the Daniel Wolf Gallery in the early 80s. And I was immediately struck by it. What was it about the work that you found interesting? I think even early on I was interested in the intersection between everyday life and theatricality. That’s something that runs through my work. Looking at the ordinary American landscape but then having it transform through cinematic or heightened liveliness. So I was very interested in his use of lighting, his focus on the American landscape, and also his obsession with the train. It was just pure obsession that he spent five years of his life without any pay or support creating his own particular vision of the last days of steam. I gather that “Rural Retreat” is your favorite Winston Link photo. Why is that? It’s about the experience of light and its dramatic effect. And how this lighting suggests a narrative. It’s visual story telling, the type of story telling that always reminded me of a scene from an Orson Welles film or a Hitchcock film. The other thing I really respond to in Link’s work generally, which is something I think is in my work, is the sense of being in-between places. The need to travel, the need to find a home. It sort of sums up a disconnection or feeling alone within the landscape. The train exemplifies that for me. Do you feel a great kinship to Link? A lot, but not on a conscious level, although I know there is a kind of connection between our work. The most obvious thing we share in common is this use of production. Of course there are differences in method, he used strobe and hot lights, and I use more cinematic lighting, but I think what we have in common is the kind of choreographed use of light which is a very subjective approach to picture making. Lights - light is so important. Tell me about the title you gave the show “American Darkness”. The phrase American Darkness comes from Pauline Kael’s 1986 review of “Blue Velvet” in the New Yorker. And I love how the phrase is evocative of nighttime and secrets, mystery, and the tension between light and darkness. How did you choose your own images to show along with Link’s work? I hope I selected pictures that one way or another play off a similar type of iconography. Travel and rootlessness, an exploration of American small towns, and a sort of loneliness and mystery. In the picture I refer to as “Railway Children” - there is the obvious reference to trains, train tracks, etc.. And in the picture i refer to as “RBS Auto” it’s the view down the street not that different from Link’s “Officer Painter Patrols Main Street”. Again that similar sense of emptiness and beauty. I gather that you brought Winston Link to Yale, what was that day like? My God, I think that is one of the most memorable days ever! He agreed to come to Yale as long as we picked him up at his home in Westchester where he had this enormous steam engine, the front car of the train, on his property. His other stipulation was that he wanted to go to Mory’s, which is the private Yale Dining Club. And then we had this great lunch where he drank three martinis. And then he gave this beautiful talk. My most distinct memory of the talk, was that at one point he took out the actual recordings he had made of the sound of steam engines and played them for the class. And it was such a beautiful moment because you felt that he was transported back to his youth and to making the pictures. Everyone got very teary when he did that. He also brought all his material, all his notebooks. It was really incredible. What did your Yale MFA students make of Link? They had never seen anyone like him! The interesting thing about Link is that he never really saw himself as an artist. He was a commercial photographer specializing in industrial subjects. He worked for Alcoa, Texaco, B.F. Goodrich. I always imagined his existence in the 50s to be similar to “Mad Men”, and then he went on this journey to take pictures of the last steam trains, purely out of his own obsession. That’s what makes him so influential as an artist. All artists follow their obsession, and he clearly did that. He kind of built pictures into existence. I think that’s what we do with photos. Gregory Crewdson’s photographs exhibited in association with Gagosian Gallery.